Ricardo de Lama y Martin, ASN 32996907, was inducted on 10 August 1943 at Camp Upton, NY. The son of a Spanish couple who had left Segovia to settle in Cuba at the turn of the century, at seventeen he had joined his brother in New York City, starting a career as an airplane pilot in acrobatic and stunt shows. Upon drafting, the Army proposed him to become a glider pilot, but he refused and was assigned for basic training at Camp Fannin as part of A company, 5th Training Battalion. Camp Fannin, located at Tyler (TX), was an Infantry Replacement Training Center (IRTC), which could handle up to about 20,000 troops at a time. After four months spent in infantry training at the IRTC and three additional months of stateside training, presumably in an Infantry unit, on 18 March 1944 he was sent overseas as an individual replacement, destination North Africa. This length of time between induction and overseas assignment as an individual replacement was typical at the time: faced with a very serious replacement shortage for overseas units (notably infantrymen), in February 1944 the War Department had decided to strip stateside units of soldiers with a minimum of six months of training to send them overseas. This resulted in an average of 48,000 replacements being shipped overseas each month, and since Ricardo de Lama was older than eighteen, and was not already a father before Pearl Harbor, he was one of the first to leave within this new replacement policy. A few months later, even the minimum six months of service policy was abandoned, and replacements were sent overseas straight after four months of RTC training. This individual replacement system in the case of the Infantry meant soldiers often found themselves assigned to units in the mid of combat operations, with no chance to acquaint themselves with their comrades and frontline conditions. In practice, this translated into a very high casualty rate among replacements. Conversely, this system of maintaining units in action indefinitely through a stream of individual replacements, also had the effect that combat soldiers lived in a doom-like world were they were kept fighting till wounded, killed, or otherwise disabled, with obvious mental and physical consequences. In some cases, veteran units overseas tried to correct this horrible situation by pooling replacements together at the divisional or regimental level, for further training and familiarization with combat situations when possible. The US 34th Infantry Division was one of them, and that’s where Pvt. De Lama was finally assigned, joining Company G, 133rd Infantry Regiment, 34th Infantry Division, in Italy on 1 June 1944, after a couple of months in North Africa, either receiving additional combat training or just waiting at a “reeple deeple” (Replacement Depot) for his next assignment. Within US Army organization of that time, Company G was one of three rifle companies in the second battalion of an infantry regiment. Each infantry regiment was organized on three rifle battalions and supporting units, each rifle battalion in turn comprised the HQ Company, three rifle companies, and a heavy weapons company armed with water-cooled .30 cal. M1917A1 machine guns and 81 mm mortars. Other supporting weapons, such as .50 cal. M2HB machine guns and 2.36” rocket launchers (“bazookas”) were also available. The three rifle companies in the first battalion of a regiment were coded A, B, and C, with the HW company being D. The second battalion was similarly organized on E, F, G, and H companies, and the third on I, K, L, and M companies. In US Army radio alphabet of that time, these letters translated into Able, Baker, Charlie, Dog, Easy, Fox, George, How, Item, King, Love, and Mike. Infantry rifle companies (with a strength of about 190 men) included the company headquarters group, three rifle platoons, and a heavy weapons platoon with two air-cooled .30 cal. M1919A4 machine guns and three 60 mm M2 mortars. The rifle squad, of which there were three per rifle platoon, was the basic fighting unit of Infantry organizations: twelve infantrymen, usually armed with cal. .30 M1 semiautomatic rifles and one cal. 30 Browning automatic rifle. In combat, veteran units could and did modify this prescribed organization, adding different types of weapons and, when available, overhead personnel. The 34th Infantry Division, originally a federalized National Guard division from Iowa, Minnesota, and North and South Dakota, was the only US Infantry division serving in the North African and Mediterranean Theaters of Operation throughout the war, the only other US division with a similar combat record being the 1st Armored Division. The 34th, which went to Northern Ireland in January 1942, was also the first US Army division sent overseas after Pearl Harbor (i.e., excluding units already stationed in the Pacific). Together with the 1st Armored, the 34th had provided most of the volunteers for the first Ranger Battalions formed by the US Army in WWII. Then, it fought in North Africa and mainland Italy, where the Division finished the war near the Alps in May 1945. Pvt. de Lama, as a combat infantryman, had taken up the most dangerous job in the US Army at war. Altogether, the 34th Infantry Division suffered 4,300 battle dead (soldiers who were killed in action or died of wounds received in action), and 11,545 wounded in action. Of the above battle deaths, 3,825 (with a proportionate share of about 10,000 wounded) occurred within its three Infantry Regiments, which at full strength (as seldom happened in Italy) comprised about 9,600 soldiers. This means that, not counting accidents, illnesses and diseases (which, on average, in the Mediterranean Theater of Operations accounted for more than 300% of battle casualties), battle casualties alone statistically accounted for one and a half complete personnel turnover in Infantry regiments within the Division during its combat cycle. Considering the daily averages of personnel in the division’s fighting echelon, the 34th division’s casualty rate has been evaluated as the highest of any division in the war against Germany. Company G, 133rd Infantry regiment, suffered 63 battle deaths. This relatively low number of deaths in comparison with other rifle companies in the 34th division should not mislead. It only reflects the fact the 2nd battalion, 133rd Infantry, had first seen action in Italy only at mid April 1944, as the unit had been previously detached from its parent regiment to serve as guard to the Allied Forces Headquarters in Great Britain and North Africa. The rest of the 133rd had been fighting in Tunisia from February to May 1943 and in Italy since September 1943, participating in some of the bloodiest battles of the entire war. In fact, by the time of Ricardo de Lama’s assignment, Company G had already suffered 15 KIA’s in the few days it had fought in Italy. 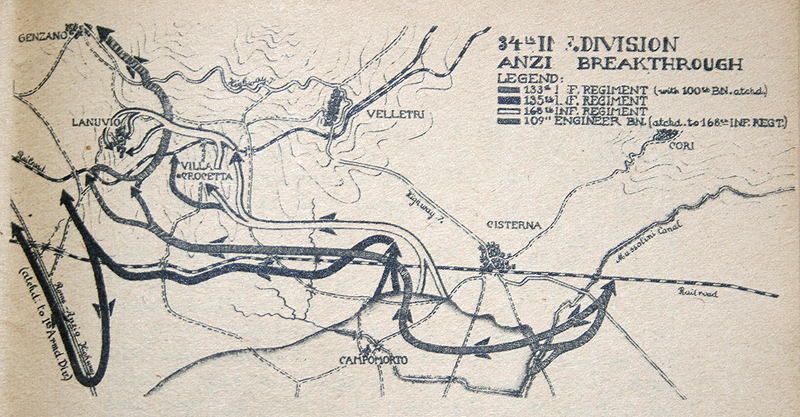 At the beginning of June 1944, the 133rd was engaged south of Rome, participating in the Allied offensive, which had broken the stalemate along the Gustav Line at Cassino and at the Anzio beachhead, where the 34th Division had landed in March 1944. Since its start in July 1943 with the Sicily invasion, the Italian campaign had reflected the disagreement between the American and British high commands about overall strategy in the Mediterranean. While the British favored a peripheral approach to the German stronghold through the Balkans and Mediterranean, the Americans pushed for a direct assault on Western Europe as the most efficient way to defeat Germany. Since it had proved logistically impossible to launch such a massive attack in 1942 and 1943, the US had agreed to invade North Africa, and then Sicily and Italy. However, with the liberation of Rome on 4 June, the invasion of Normandy two days later and the decision to divert to Southern France the main effort in the Mediterranean in the summer of 1944, Italy was destined to become a secondary front, to divert German resources away from the main battle theater of North West Europe. Such strategic considerations of course did not change the grim reality of frontline combat in Italy for Pvt. de Lama and his new comrades in arms, who in the early morning hours of 3 June 1944 were going to attack the town of Lanuvio as part of the breakthrough from the Anzio beachhead. Pvt. de Lama’s introduction to frontline duty was not easy. The objective was taken, but the advance was slow and the 2nd battalion had 12 KIA’s, none however in Company G. The Regiment was then shuttled to Civitavecchia, the main port city in the Rome area, which fell to the 133rd on 8 June 1944 with little or no opposition. From 9 to 25 June 1944, the 133rd regiment rested near Tarquinia, giving Pvt. de Lama a first respite in his new life as a combat infantryman. The men could attend movies, and soldiers were rotated to the 5th Army Rest Center in Rome. Also, 12-hour passes to Rome were issued, and Ricardo might have had his picture taken in Rome on that occasion. When the 34th reentered the lines along the Tyrrhenian coast at the end of June, the Allied advance had reached Tuscany, with the immediate objective of gaining the Arno river line and the large port facilities at Leghorn. On 26 June 1944, the 133rd was back into combat and attacking near Piombino, a coastal port town about 40 miles south of Leghorn. The Germans, who were retreating along prearranged lines of resistance, offered light resistance. The 34th advance was mostly hampered by mines and booby traps, and by the rough Tuscan terrain. As had usually been the case during the long advance up the Italian boot, it was again a matter of gaining hilltop after hilltop, and movement took the form of long foot marches for the tired GI’s. The advance was greatly aided by Italian partisans, who guided the American troops, and assisted in the capture of German prisoners. About one hundred Partisans joined the 2nd battalion in this capacity, which was a new experience for the GI’s, since organized partisan activity was not common south of Tuscany. It was during the attack on the hill-town of Campiglia, which was spearheaded by G Company on 26 June 1944, that Pvt. Ricardo de Lama received his first real test of combat, and with it also his first wound in action. That day, eight of his Company G comrades were killed in action, and probably three times as many wounded. No other details are available, such as the nature of his wound and whether he was taken out of the line for any length of time. After liberating Campiglia, the advance of the 2nd battalion continued through San Vincenzo, Castagneto, and Bibbona, small picturesque towns, which nowadays have become summer resorts for tourists. For their liberation, 55 soldiers of the 34th Division paid with their life. Sometimes objectives were taken without a fight, some others the retreating Germans offered stiff resistance. The Germans were putting up delaying actions, as they gained time to prepare their main line of resistance south of the Arno, along the Cecina river about twenty miles south of Leghorn. Here, they were determined to resist in strength, making good use of self-propelled guns, pillboxes, and dug-in emplacements covered by extensive minefields. The battle for Cecina, which took place from 29 June to 2 July 1944, was a tough one for the 34th Division and its attached units, which in four days suffered more than 90 killed in action. The 133rd alone had more than 40 KIA’s. The Germans, supported by Tiger I heavy tanks, put down intense small arms, machine gun and artillery fire, while making utmost use of snipers during the house-to-house fight in Cecina. A famous episode in the battle, which received wide echo at the time, was the success scored by an American M4 medium tank of the 752nd Battalion (attached to the 34th) which managed to put out of action a German Tiger I heavy tank with a well placed hit at close range. The 2nd battalion finally cleared the town on 2 July 1944, at the cost of 15 KIA’s, none in G Company. The Germans also suffered heavily, with 118 killed in action during the whole battle, and great materiel losses. The 133rd troops were worn out from the strenuous battles, and the regiment was placed in division reserve for a couple of days, before rejoining the fight on 8 July 1944, a few miles east from Cecina and the coastline near Riparbella and Castellina Marittima. The terrain in the area was extremely rough and progress was slow. Mule trains, manned by Italian military personnel, were used to bring forward supplies and evacuate the wounded. The 133rd was now spearheading the entire 5th Army effort, with Pvt. de Lama’s 2nd battalion being its foremost unit in the sector. The advance towards the Arno proceeded against determined German delaying actions, blown up bridges and frequent counterattacks, which hit the battalion heavily at times. On 15 July 1944, Ricardo de Lama was officially authorized to wear the Combat Infantryman Badge, the coveted mark of distinction which, as the name implies, separated combat infantrymen from all other military personnel, and which was worn by those entitled to it with greater pride than most decorations for valor or campaign ribbons. Only infantrymen who had seen frontline combat and had demonstrated a high sense of duty were entitled to the award, which for enlisted men also brought an additional $10.00 to their base pay of $ 50.00 per month. On 27 July 1944 the whole 34th Division was finally moved to a rest and training area located on the coastal Highway 1, three miles north of the town of Rosignano, next to the shores of the Tyrrhenian Sea, where they remained till 20 August 1944. During its month of advance in Tuscany from 26 June to 26 July, the Division had lost 502 killed in action, among which 13 in G Company. The first week away from the front lines was spent in recovering from the ravages of combat and cleaning equipment. Movies were available, and soldiers could enjoy swimming in the hot Mediterranean waters or engage in other outdoor sports, and contests were organized. An enlisted men’s club was established with game rooms, reading rooms, writing equipment, and a snack bar. Officers had their own club in the picturesque town of Castiglioncello. Training, however, started early in August, with road marches, range practice of all arms, small unit training, mine training and 24-hour Battalion problems and training with tanks. This was later supplemented by a training program in mountain tactics and supply, which covered such subjects as the use of pack boards, rope knotting, and care and packing of mules. The mountain classes were conducted by a British team and by an officer from the US-Canadian 1st Special Service Force, a specialized elite unit with extensive mountain training. Personalities were also there. On 19 August, British Prime Minister Winston Churchill and Fifth Army Commander Lt Gen. Mark Clark inspected the 133rd, together with several other high-ranking officers and the usual long tail of reporters. Military reporters from the Fifth Army HQ also spent several days interviewing the 133rd soldiers after the regiment was released by the War Department for publication of news and stories in all the major papers of the United States. On 21 August 1944, the 133rd moved by motor convoy from Rosignano to the vicinity of Castelfiorentino, a town about 12 miles south of the Arno river. The trip to the new training area took four-hours of driving over very dusty roads in extremely hot weather. At Castelfiorentino, the 133rd troops continued their advanced training and conditioning program. A weekly furlough program to Rome was also inaugurated. One hundred and twenty enlisted men and a few officers were sent to the Enlisted Men’s Rest Camp in Rome each week, while several more officers were sent to the Fifth Army Officers Rest hotel in Rome every five days. However, front line duty was getting near again, as the 133rd soldiers realized when a 34th Division team made a thorough regimental inspection, also covering vehicle maintenance and kitchen procedures and equipment. In fact, the 2nd battalion kitchens were found to be the best in the Division, although one wonders how that would fare with Pvt. de Lama and his comrades. The battalion also received the final “honor” of being inspected again by a well-pleased Lt. General Mark Clark on 4 September, during training with tanks and mule pack trains. Pvt. Ricardo de Lama and his comrades in the 34th Infantry Division were about to take part in some of the bloodiest battles of the Italian campaign. 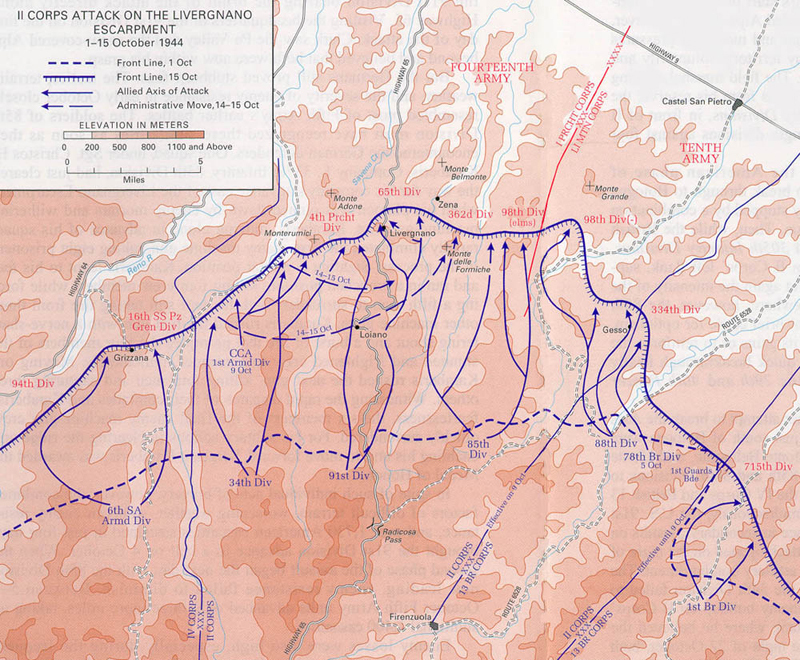 The “Red Bulls” had been picked, with the 85th and 91st Infantry Divisions, to spearhead the US II Corps assault on the central Apennines sector of the German Gothic Line of fortifications, playing a key part in the general Allied offensive to achieve a breakthrough into northern Italy or, at a minimum, prevent the Germans from transferring their forces elsewhere. The Gothic Line was a belt of fortified passes and mountaintops extending in depth along the Apennines Mountains from the Ligurian Sea to the Adriatic coast. Due to terrain features, the weakest points in the line were the mountain passes north of Florence and the Adriatic coast. 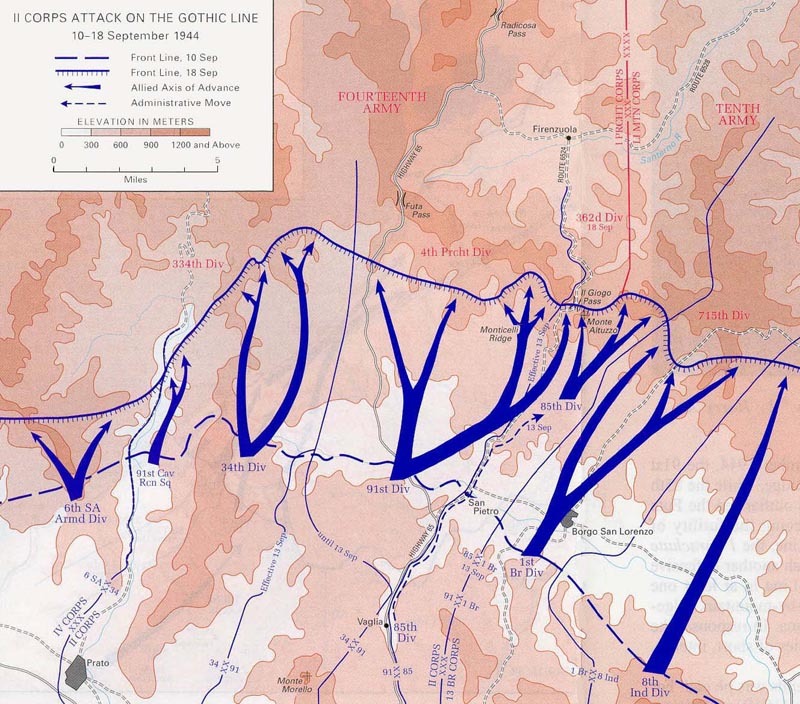 US troops were given the task of breaching the line in the Apennines, and the 34th Division was assigned the task to carry out a covering attack in force west of the Futa pass, distracting the Germans away from the Giogo Pass area, where the 91st Division was to achieve the real penetration with the aid of the 85th Division. On the night of 6 September 1944, the regiment moved by truck from Castelfiorentino to a new training area near Florence, a move of about fifteen miles over very dusty roads in complete blackout driving. Preparations for the impeding attack continued at a fast pace. Heavy rains delayed the next move to the small hamlet of Cercina at the northern outskirts of Florence. The final move of the regiment took it to Legri, the jump off for the attack on the Gothic Line. At 0530 hours on 11 September, the attack started, with Pvt. de Lama’s 2nd battalion on the right of the regimental front. The 133rd was again the point unit of the main Fifth Army effort, and German resistance was determined, notwithstanding heavy air and artillery support and the thorough preparation for the attack. For a period of nine days from 12 to 21 September 1944, the 2nd battalion was in almost continuous contact with the enemy, assaulting pillboxes and well-defended bunkers, protected by wire, extensive minefields and lanes of fire, or resisting German counterattacks. The mountainous terrain also hampered supply. Hundreds of mules and as many Italian military muleskinners were used by the 133rd, and four to five mules were lost each night due to falling off the steep cliffs and narrow trails in the dark. Small units often found themselves isolated, patrolling was a constant and dangerous affair, and casualties were the highest suffered by the 133rd during the whole Italian campaign in such a short time of combat. Altogether, ninety-one soldiers were killed in action and four hundred and thirty two wounded in action. G Company alone had 15 KIA’s (almost half of the total incurred by the 2nd battalion) and a proportionate number of wounded, probably running up to about seventy – a battle casualty rate of about 45%, if the company was at full strength at the beginning of the attack. Pvt. de Lama was among them, having received his second wound in action since his transfer to the 133rd Infantry. He was wounded on 15 September, when G Company was attacking along the Calvana hill-mass towards the saddle south of Poggio Torricella (Hill 791), after having survived unscathed G company’s toughest fight the previous day. As for his earlier experience, there is no information on his wound and recovery. We do know that throughout the battle the evacuation of wounded was extremely difficult. 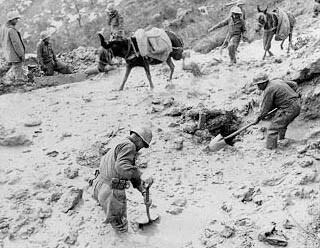 Mountain trails were often impassable even to mules and, for the most part, mined and covered by enemy machine gun fire. Litter carrying parties often could only move at night, and necessitated all personnel available from all units of the division not actually engaged on the front lines. Local partisans and civilians lead the way at night over the badly known trails and through the rough terrain in the area. At one point, litters relay chains were established to cover the approximately six miles from the front lines to the waiting ambulances, and litter bearers were kept working around the clock to the point of exhaustion. Administering aid to the wounded was also a difficult task. The 2nd battalion aid station was at times located in a gully near a totally ruined village, amid a heavily mined area, and had to work in complete darkness. With the successful penetration achieved by the 91st and 85th Divisions at the Giogo Pass to the east of the 34th division, resistance on the Calvana also slackened, and the Germans prepared their withdrawal to the north. By 23 September, the 133rd reached Montepiano west of the Futa pass, and the following day the regiment passed in divisional reserve: a well-deserved respite after such a bloody uninterrupted period in the lines. On the morning of 26 September, an impressive ceremony was held where the 34th Infantry Division Commanding General, Maj. Gen. Charles Bolte, presented many awards for valor and citations for outstanding performance of duty to soldiers of the 133rd. On that occasion, the whole 2nd battalion acted as the guard of honor, while the 34th division band played military music. By the end of September, the weather was turning cold and rainy. Like one year before, the 34th division was again struggling on mountainous terrain, fighting against the Germans and the weather at the same time. On 28 September, the 133rd was transferred close to Montecarelli, a movement of about fifteen miles along dangerous and rough mountain roads, the cold rain and strong winds all but freezing the soldiers riding in open trucks. The expected period of rest and rehabilitation was cut short almost immediately, and by the end of the month, the 133rd found itself near Madonna dei Fornelli, ready to attack in force the German strongpoints in the Mount Venere area, north of the Raticosa pass. The 34th Division was taking part in the last attempt by the Allies to reach the Po Valley before winter, with an all out offensive by the US Fifth Army and the British Eight Army. German resistance, however, was stubborn and determined, and Hitler had personally ordered his commanders in Italy to defend the Apennines line rejecting their requests to retreat to the Alps. 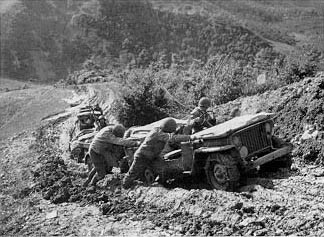 In the US II Corps sector along the central Apennines, where the main US attack was taking place, assaulting divisions sustained more than 3,000 casualties in the first nine days of the offensive, gaining only a few miles of terrain. By the end of October, the stiff German resistance, compounded by munitions and shipping shortages, troop exhaustion, the lack of replacements, and the rapidly deteriorating weather conditions would compel the Allied High Command to stop the offensive short of its objective. The offensive failed, but between the beginning of the assault on the Gothic Line in early September and 26 October 1944, the US II Corps divisions suffered more than 15,000 casualties. In the 34th alone, more than 107% of rifle company officers became casualties in the same perid. So it was that on 30 September 1944, cold and drenched by the unending rain, the 133rd infantrymen walked the final miles from the detrucking point to their assigned positions in a sea of mud. At 6:00 a.m. the following day, the men in Company G started the attack, covering the left half of the regimental sector, against light opposition at first. However, German reaction stiffened during the day. The 2nd battalion struggled to gain hold of key terrain features, which changed hands several times. Company G lost 7 KIA’s in two days of fighting, mostly caused by German artillery fire, whose effect was made more deadly by the rocky ground, which added to the fragmentation effect of artillery shells. Mines were plentiful, and the mud hampered tank support. Early on 3 October, the 2nd battalion moved to the rear for a short rest, but on the morning of the following day, they were alerted again to spearhead the 133rd attack towards the town of Monzuno, which was liberated after a stiff fight on the night of 4 October, at the cost of another KIA in Company G. Still the attack went on under the unceasing rain, which stopped all vehicles movement and put engineers troops under severe strain. When the 2nd battalion was finally relieved on the night of 7 October 1944, it had suffered 32 KIA’s since the beginning of the month, 8 of which in Company G. On 11 October the whole 133rd regiment was relieved for a four-day rest period. The men could take hot showers, get haircuts, change underclothes and uniforms, and enjoy hot meals. Mail from home was distributed and a few soldiers and officers were sent to Florence at the Fifth Army Rest Center and Rest Hotel. On 14 October the regiment moved again to the lines east of Highway 65 to take part in the 34th division attack on Mount Belmonte, a key point in the German defenses south of Bologna. The 2nd battalion, spearheading the 34th attack, jumped off at 8:00 pm on 16 October, with strong armored and air support, heading towards Mount Belmonte with Company G on the right. While the enemy was nowhere to be found, the attacking companies were immediately subjected to heavy mortar and artillery fire. Also, the terrain made orientation hard at night, and numerous II Corps searchlights pointed at the clouds were used to illuminate the area. By dawn of 17 October, the 2nd battalion had succeeded in getting on the southern ridge of Mount Belmonte, against heavy enemy small arms fire. With daylight, however, enemy tanks started firing on the exposed troops, and the 2nd battalion situation became desperate. Helped by the fog, which hampered observation and artillery support to the attackers, the Germans counterattacked in force, supported by tanks. Surprise was complete, and the advance elements of Company G were surrounded by the Germans, resulting in the capture of three officers and about twenty enlisted men. The 2nd battalion held their ground, but further attempts at resuming the attack the following day failed against the very strong resistance put up by the German 29th Panzer Granadier Division. The 133rd switched its direction of attack towards Castel di Zena. However, several attempts at gaining the objective proved unsuccessful. Casualties were heavy, and German artillery and mortar fire was one of the heaviest ever encountered during the Italian campaign. Again, troops were switched in a renewed attempt to conquer Mount Belmonte, which finally fell into American hands on 23 October, after several costly attacks and counterattacks. However, it took several more days to secure the objective against German reaction. Throughout this period, Company G, often at the point of advance, was heavily involved, at the cost of nine dead and about three times as many wounded. By the end of the month, the weather conditions steadily deteriorated. Roads and trails were mostly impassable, vehicles were wrecked or bogged down in the mud, and often not even the mule trains could bring the needed supplies to the front lines, nor help in the evacuation of the wounded. The II Corps attempt at reaching the Po Valley was coming to its unsuccessful end. The troops consolidated positions and tried to gain limited objectives. Mount Belmonte having been secured, the 133rd adopted a substantially defensive stance. In a typical action, late on 26 October a Company G outpost in some buildings northwest of Mount Belmonte was attacked by a stronger German force and withdrew with no casualties and taking three enemy prisoners. Company G called immediately for artillery fire on the vacated buildings, and this was continued all night long in preparation for an attempt at regaining the place. Company G’s attack started as planned the following morning. A violent firefight developed, but failed to dislodge the Germans from the houses. Yet, in the confusion of the close quarter battle, a German tank opened fire on the building in the wrong belief it had fallen back into American hands. This partly disorganized the German defenders, some of which ran away in disarray. US artillery immediately plastered the house and the tank in an attempt to capitalize on this mistake, but still the Germans who had remained at the strongpoint, estimated at about forty, could not be dislodged. During the following days, they directed heavy fire at the Americans every time they tried to advance in the area. Taking part in the October offensive cost the 133rd regiment its largest monthly count of casualties for the whole Italian campaign, with 151 dead, 474 wounded, and 84 prisoners of war. Against these casualties, the regiment received only 185 replacements, and its effective strength at the end of the month was more than four hundred short of approved tables of organization. On 1 November 1944, the 2nd battalion was put in regimental reserve. Soldiers received their pay, and a lucky forty-six enlisted men and five officers left for a five-day stay in Florence at the Fifth Army Rest Camp and the Hotel Excelsior, respectively. The reserve area was mud-ridden and the weather was cold, but the pyramidal tents were equipped with stoves, and three hot meals a day were served. Also, beer and other canteen rations were available. After a few days, the battalion was back into the lines, engaging in patrolling activity and reinforcing defense positions in preparation for the next phase of the campaign. Mines and barbed wire were laid, overhead shelters were built, reinforced with sandbags, timber, and corrugated iron, and gun emplacements erected with the help of unusually clear weather. German artillery fire was not intense, as the two armies settled down into static warfare. Also, all Italian civilians in the forward areas were evacuated by trucks and sent to safer locations. Altogether about 350 people were moved, including many children. Finally, word was received that the 133rd Regiment would be taken out of the lines for a nine-day period of rest, rehabilitation and training at the resort city of Montecatini Terme near Pistoia in the Tuscan plain, famous for its mineral waters and sulphur springs. Under the cover of night on 11 November 1944, the weary 133rd soldiers traded all weapons and ammunition, except personal weapons, with their comrades of the 135th Regiment, and left for Montecatini Terme by trucks. Picked by the US Fifth Army as a rest and training center for war weary combat troops, the city had already been used for similar purposes by the Germans until the summer of 1944. Tired soldiers could find relief in Montecatini’s luxurious bathing establishments, parks and gardens, and sleep in its more than 200 hotels, with electricity, running water, and fully equipped toilets and bathrooms. The town was substantially untouched by war, even if wartime conditions of course had an effect on the scarcity of goods displayed in its many shop windows. No training was scheduled for the first four days of rest at Montecatini Terme, and soldiers slept off the exhaustion of frontline service. Nightly dances were organized, attended by Italian girls from the area, at the tunes of the music played by the 34th Division Band and by Italian orchestras. Also, movies and theater performances were shown daily in four theaters. Soldiers could rent horse carriages with drivers, or shop around for Christmas gifts to send home. Mostly, however, they enjoyed the hot sulphur baths at Montecatini Terme’s famous establishments. The well-housed American Red Cross Club provided a tailoring shop, as well as reading and game rooms, a bar, and movies and stage shows. Also, the 133rd had its own reserved Italian photographic studio, where soldiers had their portraits taken to mail home. Several men spent a few days in Florence, while many others received awards, decorations and promotions. Fifth Army commanded General Clark personally awarded many of these at a ceremony on 16 November. 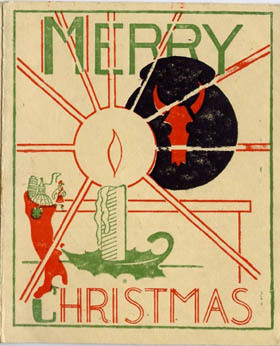 Christmas cards, for mailing to the States, were distributed to the troops on 17 November, and religious services were held daily. Maybe a more welcome visit was that of several war correspondents and photographers from the Army magazine “Yank” and from the “Stars and Stripes” Mediterranean staff, the Fifth Army Public Relations Section, as well as from commercial news services, including the BBC, who spent several days in Montecatini Terme gathering material for stories about the 133rd soldiers. These days of rest passed away fast, and on 19 November 1944, a pre-Thanksgiving turkey dinner signaled the end of the stay. On the morning of 20 November 1944, the 133rd regiment left Montecatini Terme, to relieve the 361st Regiment of the 91st Division astride Highway 65 at the farthest point of advance in the Northern Apennines towards Bologna, a mere eleven miles away. The regimental command post was established about a mile south of Livergnano at the hamlet of La Guarda, from which all civilians had been evacuated. The lines extended a few miles north, and crossed Highway 65 about half way between Livergnano and Pianoro. Observations posts were established and existing positions reorganized and strengthened, the assigned mission being to carry out the active defense of the area in preparation for the next strategic offensive, which at that stage was planned for December 1944, but would later be postponed until April 1945. Pvt. de Lama and his comrades in the 2nd battalion were assigned defensive positions on the heights northwest of Livergnano, running from i Gruppi through Lucca to Guarduzza, where the 1st battalion sector began. November 23, 1944, Thanksgiving Day, was relatively quiet. During daylight hours, the customary artillery duels took place. Late in the afternoon, the early sunset preceded the usual reconnaissance activity, with patrols on both sides probing the enemy lines. At 6:20 p.m., while on the lines at the Company G positions, Pvt. Ricardo de Lama was hit by small arms fire and died, struck by a bullet out of the dark. Ricardo de Lama was first buried at the military cemetery at Pietramala near the Raticosa Pass, about fifteen miles back from the front. Later on, his remains were relocated to the US for his final burial at Pinelawn National Cemetery, Farmingdale, NY. His wife was notified of her husband’s fate by the standard War Department telegram. Also, Ricardo’s battalion commander signed her a letter of condolences. 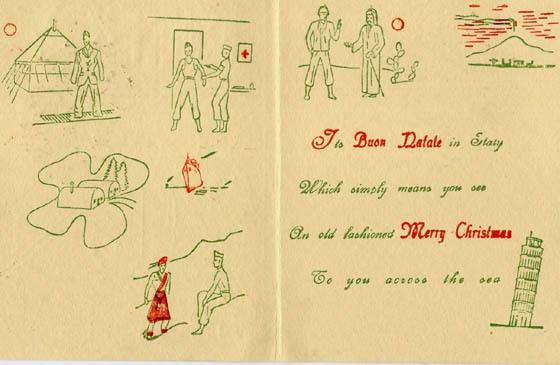 After Ricardo de Lama’s death, his comrades in Company G carried on with their job through the winter, alternating periods of frontline service with rest, training, and defensive work in the rear, being lucky enough to spend Christmas in Montecatini Terme. They then participated in the spring offensive entering Bologna on 21 April 1945, and pursued the Germans all through the Po Valley and up to Ivrea, near Turin, in the Piedmont region of Italy. One Company G staff sergeant would die in January 1945 in a road accident caused by the precipitous terrain and winter conditions, and four privates would be killed in action in April 1945, the last death casualties in the company before hostilities ended in Italy on 2 May 1945. 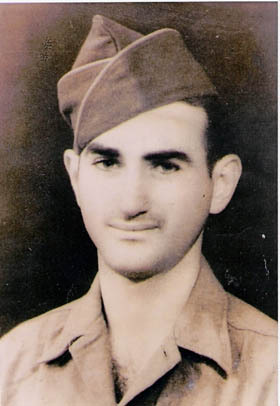 In nearly six months of service in Italy, Ricardo de Lama was wounded in action twice before his luck finally ran out. Aside from that, we do not have much information on his time in Company G. Depending on the seriousness of his wounds, or because of other circumstances we have no knowledge about, he may have been away from his unit for unknown periods. His award of the Combat Infantryman badge on 15 July may suggest he was with the regiment at the time. We do know, however, that he saw enough combat to be wounded twice and loose his life, and that is all we need as undisputable and everlasting testimony to his courage and his sense of duty and loyalty to his adopted country and his fellow comrades. Ricardo De Lama had turned thirty-one a couple of months before his death, on the exact day his 2nd battalion had acted as guard of honor during the massive ceremony where Maj. Gen. Bolte had presented awards for valor and citations for duty to many 133rd soldiers. Wounded in action for the second time a few days before, we do not know if Ricardo was present at the ceremony, or if he was still recovering from his wounds at some other place. Nor do we know, in honesty, what he and his comrades in arms really thought of the whole affair that day. We like to believe, though, that he might have shared with his fellow soldiers that common experience as a moment of due recognition for their sacrifices and a special way to celebrate his thirty-first, and unknowingly last, birthday. * The 133rd Regiment’s monthly reports, on which this story is also based, are available online at http://www.34infdiv.org/history/133narrhist.html thanks to Mr. Patrick Skelly, historian and secretary-treasurer of the Tri-state Chapter, 34th Infantry Division Association. His highly recommended website is an invaluable resource on the history of the 34th Infantry Division in World War II.